High school students have a slew of post-graduation aspirations. Some hope to attend university, others want to break barriers to make history or pursue their true passion. Jade Lyons, the first-ever player to sign with the new UOIT Ridgebacks women’s basketball team – is doing all three. 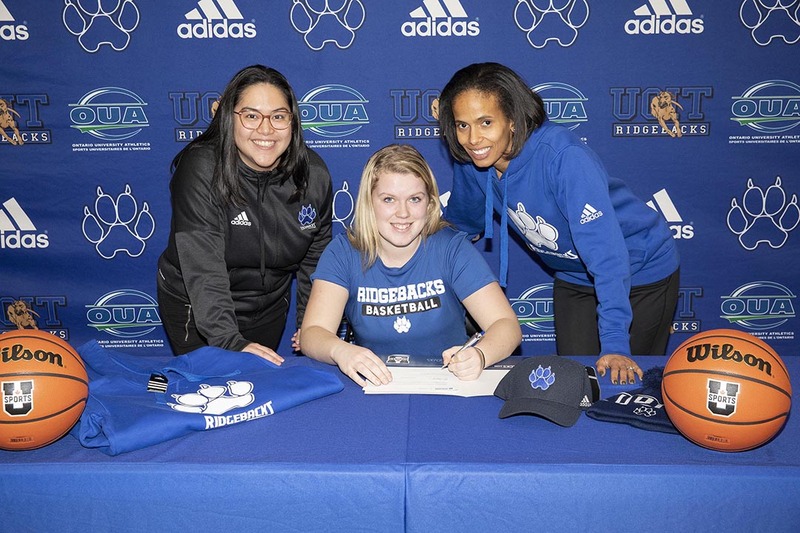 The 17-year-old is currently attending Immaculata High School in Ottawa, but will be playing basketball when the University of Ontario Institute of Technology (UOIT) plays its first season in the Ontario University Athletics (OUA) league this fall. She will trade Ottawa for Oshawa, as a first-year student in the criminology and justice studies program. “I’m looking forward to being able to prove ourselves, to prove the Ridgebacks are here to win and we’re going to compete,” says the 5-foot-10 forward. 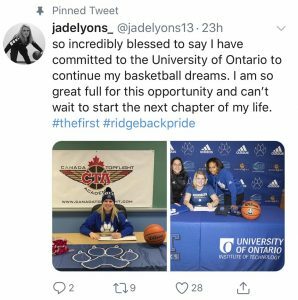 Jade Lyons shares her UOIT Ridgeback excitement on Twitter. Ridgebacks head coach Christa Eniojukan is very impressed by the versatile player. “She’s a high character kid, she’s very hard-working and determined, both on the court and off the court,” Eniojukan says. Lyons is a relative newcomer to the sport, first playing at age 12. After watching her play in an elementary school gym, a coach encouraged Lyons to try out for the Grade 8 team. Although she wasn’t a Grade 8 student, she made the cut and says as soon as she was on the court, it felt like home. A huge Toronto Raptors fan, Lyons says she has found an important outlet on the court. “Basketball has been there for me through so many different obstacles and struggles I’ve faced until now, it’s something I really couldn’t live without,” she says. She played for the Naismith Gaels from 2011-16 followed by the Nepean Blue Devils from 2016-17. She is currently playing her second season on the Canada Topflight Academy (CTA) team. CTA head coach Mario Gaetano has enjoyed mentoring Lyons for the past two years. “We definitely will miss Jade’s leadership on the court and her personality off the court,” he says. Lyons is familiar with joining a basketball program in its infancy, aligning with CTA in its first year of operation. Gaetano expects her to shine for the newly-minted Ridgebacks. Although she will leave the CTA program this spring, Gaetano will meet Lyons again this fall, this time in opposing roles. Gaetano has been the assistant coach of the University of Ottawa Gee-Gees since 2007-08. Lyons says her basketball goal was to play at a university level. She chose UOIT after a December visit to the campus. She says after carefully previewing photos online, the in-person tour made her fall in love with the school. Lyons initially planned to reach out to other coaches and schools but after experiencing UOIT, she says it was her only option. Lyons is the first to sign with the Ridgebacks, others are expected to follow soon. She met 14 other recruits on the campus tour but doesn’t yet know who else will join her on the team. “We have a couple of more signings coming and we have a bunch of girls in their final decision-making process,” says Eniojukan. Currently a co-captain of her CTA team, Lyons is ready for any opportunity as a Ridgeback. “Whether or not the title I have is captain, I’m always in the position to lead or help out my teammates,” Lyons says. Lyons will soon proudly sport her Ridgebacks jersey but don’t let her fierce game face fool you. “Even though when I’m on the court I’m told I look really mean and aggressive, I’m down to earth and I care for everyone,” Lyons says. And the care she gives, she also receives. Her family, including her parents and three younger siblings, will be cheering her on. “I know they’ll be coming out to almost every game to support me – I can’t wait until the home opener,” says Lyons.